Mahabharata Immersion (MI) is an offering from Ritambhara, an invitation to experiment with oneself, delve unto the depths of the invisible, the unarticulated and the disowned parts of ones self by working with the stories from the great epic. The following is a conversation between Gayatri Iyer and Raghu Ananthanarayanan, the creator of the MI, on the latest MI workshop that took place in Feb 2019. Gayatri: What were the other explorations? Raghu: The Karna and Abhimanyu exploration was very interesting. The actors exploring the theme found it tough to get to the core. Both Karna and Abhimanyu are counterpoints and, in the scene, enacted, they have to see how to break or end the chakravyuha. Gayatri: How are they counterpoints? group wanted to explore was: how does one keep the Abhimanyu alive inside keep investing in the future, and not the bitterness of a Karna? Raghu: At one level all of us enter the world like Abhimanyu entered the chakravyuh- full of hopes, optimism, potential etc. but with every rejection and hurt we end up embracing the victim archetype. Gayatri: But this is a lifelong story of Karna, I know I keep falling into this trap regularly. Raghu: Yes of course, that is why Pandava go on an exile more than once. Gayatri: But the 1st exile when they go into the wax house. Here they do not confront their shadow side which they did in the 13 years. So, how was it beneficial for them? Raghu: No, the first exile is their birth. The second exile is because, the shadow sides of the Pandava played out in their naivete. Symbolically, the wax they accept to live in is the idea of a self that is flimsy and fragile like a wax house. So, unless I confront these flimsy inner structures and find a way to transform them, I would never know how to create a new order for myself. The Kaurava never go back and ask themselves ‘how did I create the problem? How have I violated dharma or what is human?’ They never go into an exile self-reflective mode; thus, the violence is re-enforced. Gayatri: But Duryodhana understands that he is consumed with envy for the Pandava, and he cannot do anything about it. Raghu: It was too late, he knew he was consumed but that did not make him pause and stop the war. He does not go back to the drawing board to figure out what is he doing wrong and how should he act? This is the critical difference between Kaurava and Pandava. Under intense confrontation from the world, each of us has an opportunity to see who we really are. This I believe is possible only through a Pandava kind of questioning or reflection- how am I creating this duHkha for myself, for everyone? How do I go into a transformative mode? The Kaurava kind of path will only let you look at quick fixes or external solutions that ultimately reienforce what they have been doing. Just like having a blind father who will keep indulging his son’s stupid acts, instead of parenting I become blind to my own negatives. Raghu: Yes, she was, but it went into something very excessive in my opinion. There was more of a discharge than examination of her power in the sabha. Gayatri: I am guessing the vastraharana episode was enacted? Gayatri: Actually, she stood with her head held high and spoke lucidly and clearly making everyone else’s head hang in shame. Raghu: Even if she felt the oppressiveness, she did not let it come in the way of her true power. Gayatri: So, when you said excessive, I am guessing it was more of a patriarchy bashing session? Raghu: Yes, but the rest of the group did not catch it and it took some dialogue before one participant saw how important it was for women to hold their anger in dignity. Raghu: Well, if a woman holds her anger in a constructive way dharma can be created, because she is the fulcrum of everything around her. Gayatri: But in the sabha Draupadi was angry and wailing, so where was her nurturant self? Raghu: None of her statements were reactive, and the anger came from a place of questioning dharma. It was not out of self-pity or victimhood. Asking a question like ‘By violating the most vulnerable amongst yourselves, who are you?’ These questions left the elders stunned and they hang their heads in shame. Gayatri: So, is it questioning today’s space where we violate the vulnerable? Raghu: In my opinion, it has nothing to do with today’s space only. It is a perennial question: how can I heal my deepest wounds to get over victimhood? These hurts will continue to stoke a hate or anger vis a vis the world outside. Thus, it is very important to get this victim part of oneself transformed. Gayatri: So, it would only lead to vengefulness no? Raghu: Yes, vendetta that does not create a new dharma. That is why the heroism of the vulnerable and weak can become a powerful energy. Gayatri: I recall Karna, also could not get past all his hurts and victimhood. Isn’t it? Raghu: That is correct. If he did find a way of really looking at it and saying yes, I will own up to all my potentials and use it to create a future that I can shape, one that is unlike the past. Though he was offered many possibilities of doing so, he could not give up the past hurts nor his commitment to Duryodhana. In fact, every Kaurava is entrenched in the past, thus acting out of greed or vendetta including Drona. Raghu: Drona is nursing an old hurt that he received at the hands of Draupadi’s father. Gayatri: But every stage in your life you are continuously hurt, so how can you block the past or prevent any hurt? Raghu: Yes, there is no guarantee that you will not be hurt in future. But if I am transformed, I will look at these hurts from a space of compassion and shAntam rather than fear, anger and the like. Thus, I am not re-enforcing those energies. Gayatri: So, all the explorations that happened in this MI were about transforming the shadow side like Bhishma, Karna and Draupadi. Correct? Raghu: Yes. Well, if I take the whole inner structure of say Bhishma. He was born Devavrata, who takes a vow of celibacy and then becomes Bhishma. Everyone hails him for his vow and that identity gets re-enforced all the time. This sacrificial energy he has put to shape himself is what I call the archetypal Bhishma. Any rigidly held identity, will have its shadows. This identity is not in-sync with the current context and the sacrificial energy will play up in a negative way. This negativity or anger was played out beautifully in the exploration of the group. 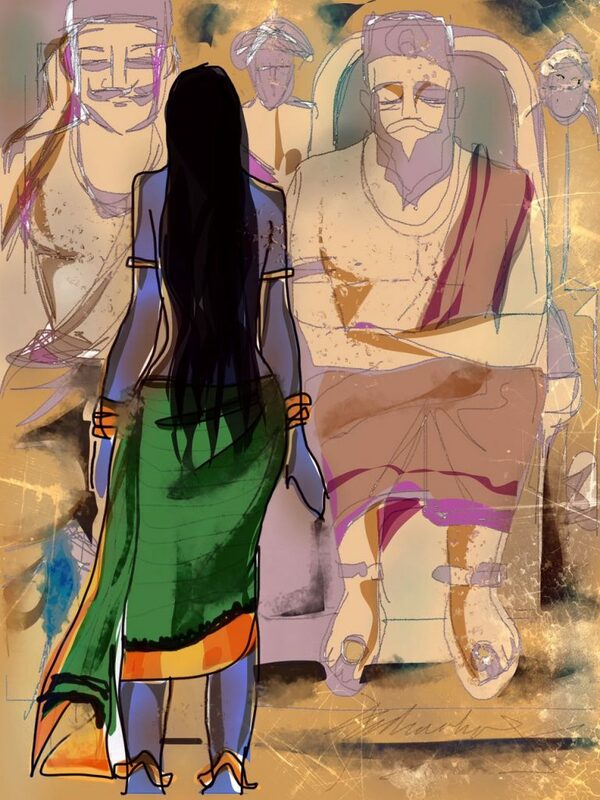 Bhishma reacts to Satyavati saying ‘It is because of you I had to make this commitment..Now, I will stick to it.’ Such structures will contain positive sides like Bhishma’s great warrior capabilities, his will power to hold on to a commitment made and so on, but the inherent shadows too are present. Thus, the whole structure is stuck in the past and he is not in touch with his feelings, so naturally it is adharmic. Gayatri: These explorations bring up so many untouched parts of yourselves, isn’t one left like a live-wire? Raghu: Well, that is part of the Immersion, to step back and see what identity patterns I am stuck with and ask myself how I wish to live in future. These energies unconsciously drive you any case, so now that you are aware about them try and shape these energies into something meaningful for you and the context. Gayatri: What practices can one adopt in daily life? Raghu. Practice the sakhi and sAkshi bhAva, my awareness to my emotional dynamics must be alive. The immersion gives you a lot of takeaway practices right from body work, asana, self-reflective art, dialogues with people who receive you with compassion and of course a space to dialogue with yourself. Gayatri: Are people aware about the ‘inner dialogue’? Raghu. Of course! The Immersive space was created because people were having an inner dialogue. Gayatri: But today, where are the spaces for dialogues? Even internally? Raghu: Unfortunately, true, society is built only for performances and results. There are hardly any spaces for dialogue. Even temples, which were a place for self-reflection have become a place for bargains! Thus, it is very important for the sanity of the society that there are safe communities and spaces where self-reflection is possible or a place where one can have a dialogue with oneself or others on what is the right thing to do in one’s life today. The absence of this is what makes society into an exploitative arena like it is today. Gayatri: Yes, all politicians and leaders are perfect examples. Raghu: Not only them, look at the CEO’s, professionals and home-makers too. The spaces they create are performance arenas. Gayatri: What was personally evocative for you in all the explorations? Raghu: What struck me was the difficulty in the exploration of Karna because the deepest hurts to deal with are that of absence-what is taken away from him, what he loses in life is so deep. Duryodhana had a father to go back to, to argue with or extract indulgence from. Karna was yearning for a mother and father all his life. When Kunti finally owned up to him, it was only to disown him again and make a bargain! I thought that the biggest reason why he is a favorite all over the world is because his deepest exploration is the absence of nourishing relationships, parents, social processes, legitimacy to act and so on. Instead he is deprived and denied what ought to be his through merit. Every one of us experiences one or the other of these psychological hurts. Gayatri: But later in the war he displays some amazing heroism to which Shalya his charioteer had to acknowledge. Raghu: Of course, he showed a great deal of heroism in the war except that it was anchored in past hurts and vengeance. Gayatri: But how can such deep hurts of childhood where parents are absent or anything traumatic ever go away? Raghu: You always have a choice my dear, either to work with it and transform it or continue to perpetuate it to only harm yourself and others. Gayatri: As you were speaking, I was transported to my own exploration of Karna where you mentioned that the hurts of absence for children below the age of 5 is very deep. Raghu: No one’s experience in this world is perfect, there would absence of necessary experiences or an excess of an experience too. Some can be inefficient or inadequate too, so these hurts are very REAL. Now, can I access these hurt spaces, acknowledge them and transform them without looking for external crutches? Gayatri: That is sAdhana right? Gayatri: The MI reflections always leave me with lumps in my throat. Raghu: Of course, they are very poignant stories of the human condition. Mahabharata is not a story telling you what is right or wrong, it is the story that tells you what happens if you do not really search for true meaning or what is healing and dharmic, and how your actions end up being so destructive. Gayatri: Did the quest for Krishna come into play? Raghu: It did, and I always ignore it…Hahahah… The need for Krishna comes up as a dependency. Some people understand that to move into the sAkshi or sakhi space is truly Krishna’s voice or the inner intelligence’s energy. Gayatri: Yeah, I guess it is tough for people to understand. Raghu: It is tough if people have been reinforced with the idea of an external God which Hinduism, Jainism and Buddhism negate all the time. If you are curious and interested to immerse yourself in this journey, the next edition of Mahabharata Immersion is scheduled on August 4th-10th 2019 at the RitambharaAshram, Kotagiri, Tamil Nadu. Write to us at ashram@ritambhara.org.in for details.